Two years and 80 days after first applying for planning permission, RWE npower finally received full planning permission to proceed with the “development” of Thrupp Lake into a waste disposal facility for ash from Didcot A power station. On 28th August, Oxfordshire County Council finally issued approval of the proposals submitted to satisfy all the Conditions Precedent. See separate story. Despite the outcome of the Town Green Public Inquiry not yet having been announced, RWE npower have indicated that they intend to start work this months. A temporary closure order for the public byway (BOAT No.9), which runs alongside the eastern shore of the lake, has been issued by Oxfordshire County Council (the notice was published in the Herald on 31st August) closing the track to vehicular traffic for 2 weeks from the 17th September. Other traffic (pedestrians, cyclists and equestrian) will be able to use a diversion. Work on constructing this diversion will begin on Monday 10th September. The closure is to enable npower to install the pipework across the byway in preparation for dewatering. A further closure is planned for mid February. It is believed that this is to install the crossing across the byway for construction traffic, which will operate between npower’s sites at Lake E and Lake G.
RWE npower may now have full planning permission to proceed with the development. Now, the only things that stand between this beautiful lake and its total obliteration are a few breeding birds and the awaited outcome of the Town Green application. Further protests are being organised. Npower started work this week, laying pipework across the byway on the periphery of the site. 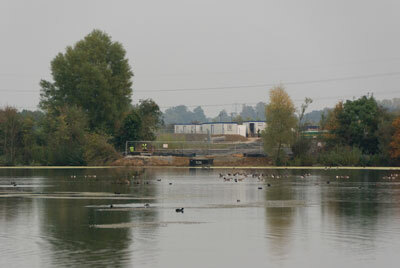 Npower have constructed a causeway leading from the byway alongside Thrupp Lake to Lake G to the East. Unmentionable stuff has been laid under the byway, and a new surface laid on top. showing npower’s new construction site. A newt barrier has now been constructed most of the way around the lake. This intrusive and unsightly artifice is to prevent great crested newts from entering the lake, which they may do in the spring, in order to breed. The design of the barrier is such that the newts leaving the lake will tend to follow the line of the barrier and fall into one of a number traps placed along its length. About 30 great crested newts had been caught this way as of 8th October, which is a considerable number considering that it would represent only a small proportion of the number on the site as a whole. The newts, we are assured, will be released elsewhere in the area. The great crested newt (Triturus cristatus) enjoys, or rather should enjoy, the highest possible level of protection under European law through the EC Habitats Directive (Annexes 2 and 4); the Bern Convention; and the UK Conservation (Natural Habitats, etc.) Regulations 1994; and under Schedule 5 of the UK Wildlife and Countryside Act 1981. This presence of this species had the potential to cause npower some problems with their planning permission. Npower’s Environmental Statement quite unashamedly plays down both the extent of presence of great crested newts, and the importance of the lake to them. In early 2006, when the Thrupp Lake planning application was still being put together, Little Wittenham Nature Reserve was declared a Special Area of Conservation largely on the basis of its population of great crested newts.